Lord Mayor’s procession, 1683 – Francis Collection. Chris Dodd spoke on ‘wherries and ferries’ at the Docklands History Group’s conference on Thames River Crossings at the Museum of London on 13 May. He described how centuries of rowing as a way of life was eroded by wheel, bridge and steam – only to leave a legacy of racing and recreation to amateurs who sat at the feet of the professionals. In an age when using oars usually means sport or recreation, it is easy to forget that for hundreds of years, rowing was a way of life on rivers, lakes, in coastal waters and in ports. Just as most today can drive a vehicle, so most who lived near water could use an oar when called upon. And the Thames was a very good example. As London developed into the world’s largest city and busiest port, so thousands were employed on the length of the Tideway as watermen to ferry passengers upstream and down and as lightermen to move cargo betwixt ship and shore and for centuries there was only one bridge – London Bridge – over the tidal Thames. The next bridge was 25 miles upstream at Kingston, whose crossing is alleged to go back to Anglo-Saxon times. 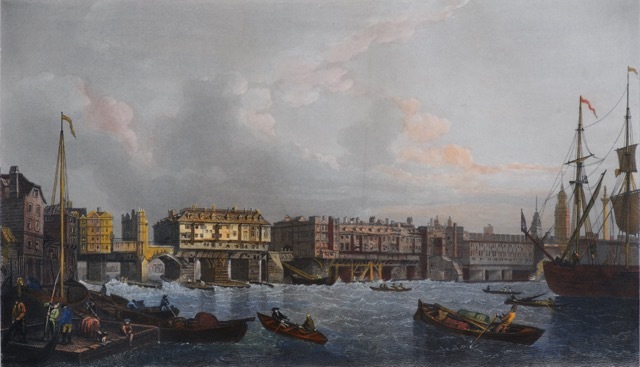 London Bridge 1745 – Francis Collection. Like Venice’s Grand Canal, the Thames was more than a highway. The rivalry between royal progressions and mayoral processions turned it into a theatre of the spectacular. Monarchs’ flamboyances are countered by the puffing chests of the city’s livery companies, rowed about on ever-grander gilded barges. Cardinals and chancellors, merchants and aldermen pay calls by barge, powered by their own retained and liveried watermen. The arrival of a new Queen or the occasion of a coronation is turned into theatrical extravaganza that brings fame and profit to the dramatists of Tudor England. At the drop of a bag of coin, they lay on enormous pageants – sea battles against infidels, firework displays to light up the town, floating street theatre to stun the populace. All this requires manning the oars, shifting the scenery, building the floats, setting the stage and gilding the lilies. The entertainment business created work for men in boats just as did manning rich men’s barges, over and above the regular business of servicing ships at anchor and ferrying the population upstream and down. And being pressed, usually against one’s will, into the navy. By Henry VIII’s time, anarchy prevailed on the river, and the King decided to take action. He addressed the problem in a statute of 1514: ‘It had been a laudable custome and usage tyme out of mind to use the river in barge or whery bote’. He thought that the prevailing low opinion of watermen and their practices should be brought to order. There was sufficient concern for Parliament to pass an Act governing fares for passengers and their fardels – little bundles of carry-on hand luggage – on tidal Thames and Medway. The Act was the first attempt to regulate watermen, wherrymen and bargemen. Was this simply a question of poor boat building, a desire for cheaper boats, or a quest for lighter and speedier craft to convey the passenger to his destination quicker and satisfy the racing challenges that are bound to arise on the river? The Act decreed that eight persons ‘most wise, discreet, and the best sort of watermen, being householders, and occupying as watermen upon the said river, between Gravesend and Windsor’ be appointed to oversee watermen and their activities. This was, in effect, the birth of the Watermen’s Company of the River Thames (lightermen joined the Company in 1700). The overseers, or ‘rulers’, were to be appointed initially by the Mayor and Aldermen of London from the first day of March 1555 to ‘maintain good order and obedience amongst wherrymen and watermen upon the Thames betwixt Gravesend and Windsor’. Regulated fares kicked in, in 1517, 500 years ago. The Act also gave birth to the Company’s apprenticeship scheme, which is still going today. 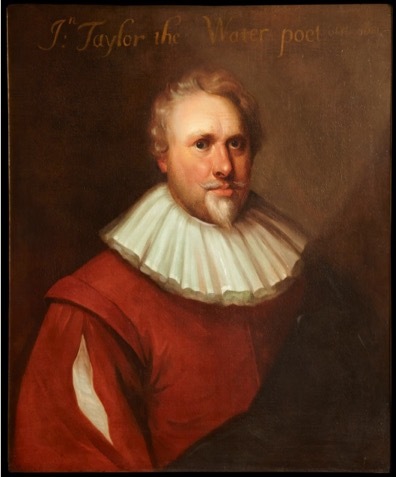 John Taylor, the Water Poet – Watermen’s Hall Collection. ‘Twere basenesse and stupidity in me. To serve his King, as well as other too. I alwaies did and doe hate those abuses. Then he that is with ill-got thousands sped. The hub of the watermen’s activity was London’s only bridge. Here was the crossroads of the City, where the purveyors of bread and circuses met and posted their bills of fare. Thousands traversed between Middlesex and Surrey on the bridge, while watermen at nearby stairs had a never ending queue of customers wishing, in the words of an unknown poet, to ‘lightning flog it, up the Thames as swiftly jog it’ for Westminster, Gravesend, Greenwich or Lambeth and all stairs in between. Before the Great Fire that destroyed it, the Old Swan in Upper Thames Street was a regular haunt of the chief secretary to the Admiralty and diary keeper, Samuel Pepys. One of the attractions of the Swan and other nearby premises was the continuous ebb and flow of traffic passing over and under the bridge. Imbibers enjoyed the hourly tidal wave of passing humanity, and customers of the wine house could drink their ‘genuine old port and sherry, drawn from casks,’ and view the bridge shooters and boat races. Was fain to stand upon one of the piers about the bridge… I found the Thames full of boats and galleys and upon inquiry found there was a wager to be run this morning. So spying of Payne in a gally, I went in to him, and there staid, thinking to have gone to Chelsy with them. But upon the start the wager boats fell foul of one another, till at last one of them gives over, pretending foul play, and so the other row away alone and all our sport lost. The wherry that won the first Doggett’s Coat and Badge Race by Peter Monamy. Note rowing positions, long prow for nudging between boats clustered at steps or beaching at low tide, passenger seat with backboard – Watermen’s Hall Collection. And it was hereabouts that the Irish actor and comedian Thomas Doggett experienced a stormy row home to Chelsea and commemorated the bravery of the apprentice who took him there by founding his annual Coat and Badge Race in 1715 – a five mile slog in wherries against the tide, and thus a severe test of watermanship. These days, competitors benefit from racing with the tide and use fine racing boats instead of heavy clinkers. 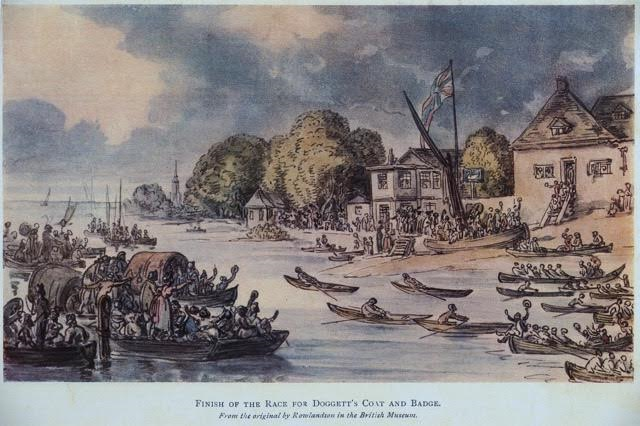 The finish of Doggett’s Race by Thomas Rowlandson – Watermen’s Hall Collection. The bridge that opened in John’s reign in 1209 had 19 arches and a drawbridge with a defensive gatehouse at the southern end. Its 26-ft carriageway was reduced by up to 14 ft. by houses and shops along both sides. Crossing over the bridge was, therefore, often as frustrating as passing under it. The arches of the bridge were narrow, with piers protected by boat-shaped wooden ‘starlings’ that further hindered navigation. Waterwheels in the two northern and two southern arches turned grain mills and hampered flow and navigation at both ends, acting as a barrier to hold up the tide. The difference between water levels above and below the bridge could be as much as six feet (two metres). Thus shooting it was hazardous when the tide ran. The bridge was for ‘wise men to pass over and for fools to pass under’. A special breed of watermen known as the bridge shooters arose, prepared to take on the rushing water, and accidents there were many. As o’er the surge I drift along. Unsurprisingly, many preferred to alight from their wherry and proceed on foot past the bridge before resuming their voyage. Over the years, London Bridge was prone to damage by frost, fire, siege, falling masonry and shipping accidents, all of which could affect river traffic. The livelihood of watermen was also hampered by weather conditions beyond their control. Fares were threatened by fire, flood, frost, freeze and plague. But their lives eventually entailed a futile, two-century long rear-guard action against progress borne by wheels, bridges and steam. Whilst all our profit runs away on wheelees. The first indicator came in 1565 when Guylliam Boonen presented a coach to Queen Elizabeth. In the seventeenth century there began a trend towards processions on land instead of water, and the watermen were soon faced with these new predators. By 1601, there was traffic congestion in the City. In 1634, the first Hackney carriage stand was established in the Strand, with four vehicles and liveried drivers. In 1635, hire journeys of less than 3 miles were banned, showing the influence of objectors to the multiplication of damned wheels, but by 1710 there were 800 licenced Hackneys plus sedan chairs operating in London. Next year the Lord Mayor acquired a state coach. Worse was to come – in 1800 Cabriolets or ‘cabs’ arrived in London from Paris, and gigs were trotting the streets. Then on July 4th in 1829, Shillibeer’s ‘Yorkshire Stingo’ introduced an omnibus route from Paddington to the City, carrying 8 passengers for a fare of 1s, which was soon reduced to 6d. And just as ominous for watermen was the opening of the Stockton and Darlington Railway in the distant north. The next major threat to watermen was river crossings. Apart from the Horseferry linking Westminster to Lambeth, the nearest crossing to London was 25 miles upstream at Kingston. Until 1729, that is, when a wooden toll bridge linking Putney to Fulham opened, 15 miles from London Bridge (replaced in 1886). Hefty compensation was negotiated for the Putney watermen. Soon there were coach services from rural Fulham to London. The first proposal for a crossing at Westminster came in 1664. Work began on a later scheme in 1739, and the bridge opened in 1750 (replaced in 1862). 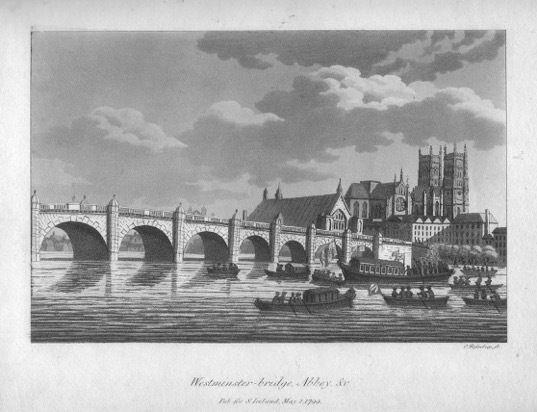 It was seen in Westminster as a victory over the City and the Church, while those interests dubbed it the ‘bridge of fools’ because it was proposed to finance it by lottery. 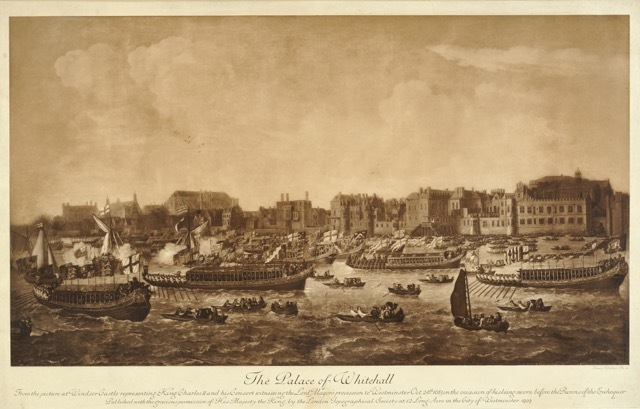 The rulers of the Watermen’s Company saw a threat to wherries between Vauxhall and Temple. Lightermen in the coal trade petitioned against it on the grounds of navigation problems likely to ensue. Inhabitants of Southwark feared injury to trade and a run on parish funds to support ruined watermen. Old Westminster Bridge – Francis Collection. The Westminster development alerted the City authorities to possible loss of business and led them to build a bridge on their boundary. Originally named Pitt Bridge, it opened as Blackfriars Bridge in 1769 (replaced in 1869, widened in 1907-10). Meanwhile, shops and houses were removed from old London Bridge in 1763, thus speeding cross-river traffic. Old Putney Bridge – Francis Collection. 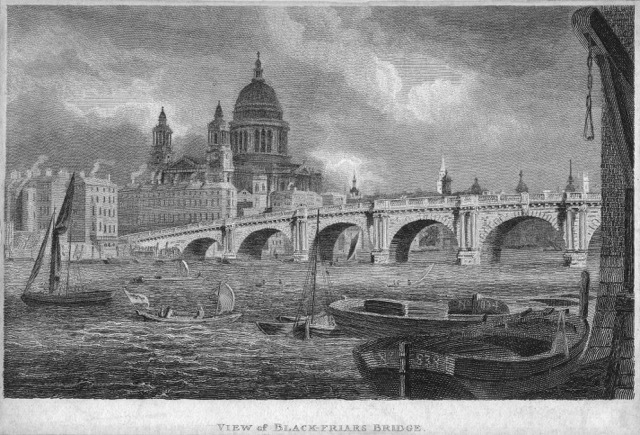 Old Blackfriars Bridge – Francis Collection. These three – Putney, Westminster and Blackfriars – constituted a major blow to watermen’s trade. Despite the statutory insistence on stairs being constructed at each end of bridges for passenger access to wherries, roadway access to Southwark, Lambeth and the way to the Cinque ports made a fatal dent in boat journeys on the Thames. And Satan seize the steamers! Many more bridges were to follow, but the final blow to watermen who plied at oars was their immersion in hot water. 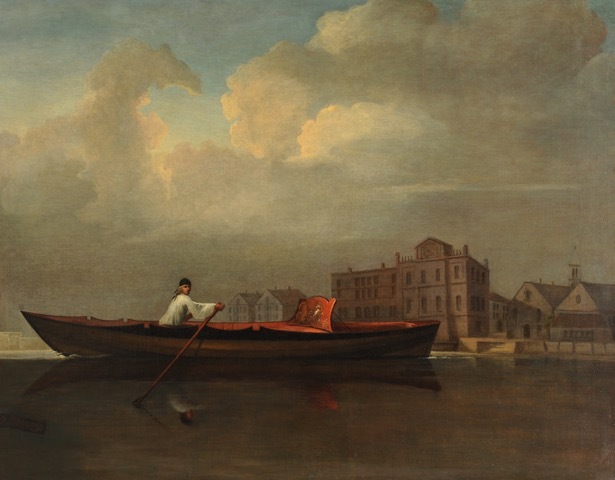 In 1783, the London Chronicle made reference to an experiment with steam-powered oars. Five years later, James Taylor tried out a steam engine on his lake at Dalswinton, near Dumfries. In 1786, there was a steamboat on the Forth and Clyde canal. This was the start of something big. The public are respectively informed that the new London steam packet Margery, Captain Cortis, will start precisely at ten o’clock, on Monday morning, 23 inst. from Wapping Old Stairs, near the London Docks, to Milton, below Gravesend, and will return from thence, at the same hour on the succeeding morning to the same stairs, the said packet having superb accommodation. The fare was four shillings in the main cabin or two in the fore cabin. 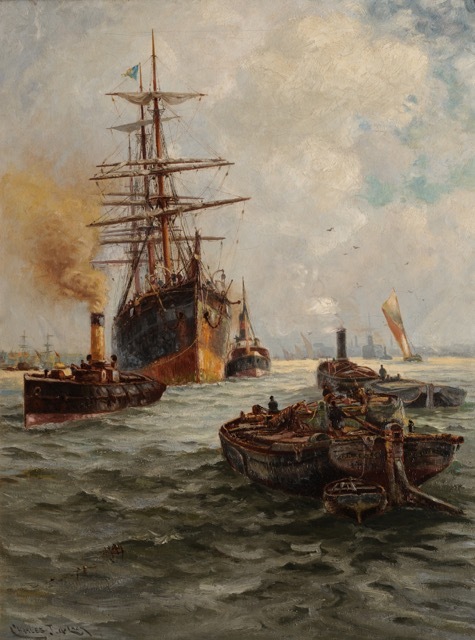 Shipping in the Pool by Charles John de Lacy – Watermen’s Hall Collection. Lightermen, those who rowed cargos between ship and shore, also had their lives changed by the steam engine. Steam tugs could move strings of barges hither and thither and defy the direction of the tide. 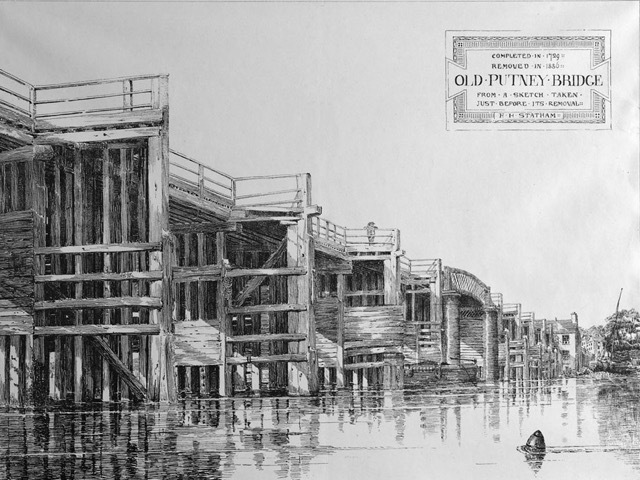 The 1800s also brought enclosures to the Thames in the form of docks that were to keep the port in business as the world’s busiest for another century. The process turned the riverbanks into a series of vast fortresses to trade and commerce, designed to keep cargos accountable and plunderers out. Lightermen had to fight for access rights to continue their role. Watermen and lightermen continue to work the river, its ferries, tugs and pleasure launches, but today they are numbered in hundreds rather than thousands. The Watermen & Lightermen’s Company maintains its apprenticeship scheme to teach ‘the knowledge’, and part of this is to encourage sculling as a contribution to learning watermanship and the ebbs and flows of the Tideway. There is nothing like rowing a light, narrow, flimsy craft a few inches above the surface to experience the power and wiles of a waterway. An annual race from Greenwich to Westminster keeps alive the art of rowing dumb barges. Greenwich to Westminster Barge Race, 2012 – Christopher Dodd. The Boat Race from Putney to Mortlake is a prime example of watermanship as experienced by professionals who competed on this water and passed their knowledge on to amateurs. The annual match between two private clubs is a challenging four-mile race on a giant S-bend, so if there is a crosshead wind at the start, it will be a cross-tail wind further on. There are only three basic rules – to get from P to M in the fastest possible time, to pass under the centre arches of Hammersmith and Barnes bridges, and the umpire’s word is final. The centre of the course is deemed to be the centre of the tide, and the race is usually run an hour before the top of it., Because every tide is different, coxes and umpire must forge an understanding of the latter’s view before the race begins, so that seeking the best of the tide does not end in clashing disaster and the threat of disqualification. 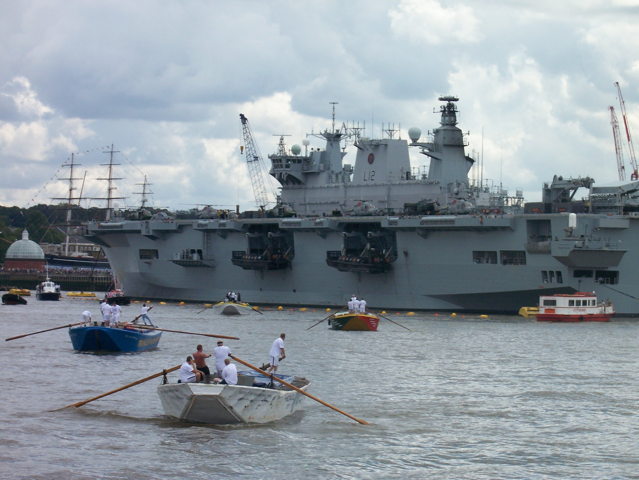 Lastly, the Diamond Jubilee procession in 2012 is an example of pageantry that is returning to the Thames, exemplified by the annual Great River Race for craft powered by oars. Which brings me back to where we started. For centuries, the watermen of the Thames – and countless other places – lived by the oar, and often raced each other for prowess and prize. The annual Doggett’s Coat and badge is testament to that. Incidentally, until about 30 years ago, Doggett’s used ‘committee’ boats, an identical set of clinker-built craft supplied by the Fishmongers’ Company that, as keeper of Thomas Doggett’s will, stages the race. The last of the last set of these was recently added to the boat collection at the River & Rowing Museum. It was built by Radley boat builders of the River Lea, found in a dilapidated state at Hexham Rowing Club in Northumberland, made rowable by its rescuer Roger Bean, and eventually restored by Bill Colley of Richmond, funded by Clive Radley, a descendant of the builders. In the nineteenth century, then, these professional oarsmen taught amateurs to row, and what we know today as the sport of rowing owes its origins to them. 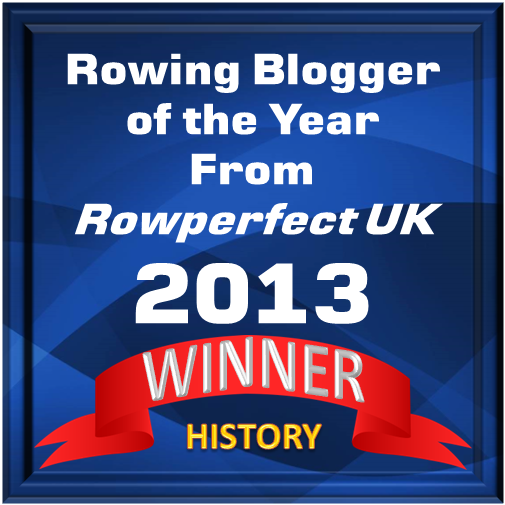 Rowing began as a way of life and can claim to have morphed into recreation and competitiveness long before any other lifestyle. History of the Origin and Progress of the Company of Watermen and Lightermen of the River Thames 1514 -1924 (in five volumes) by Henry Humpherus and Jon Temple. Previous What kind of Skiff is this? A lovely piece. My only gripe is that “I think, therefore I am” was Descartes, not Einstein.